Censorship about censorship in South Korea? When I opened the International Herald Tribune last Thursday, I made a bet with myself. I've waited until today Sunday and for the moment, I've won it. The bet? "I'm pretty sure I won't see this article with the same title online, if the article ever makes it online". This article mentions a few facts. For instance, that international observers sometimes put South Korea on par with countries like Russia because the government shows little tolerance for critics. 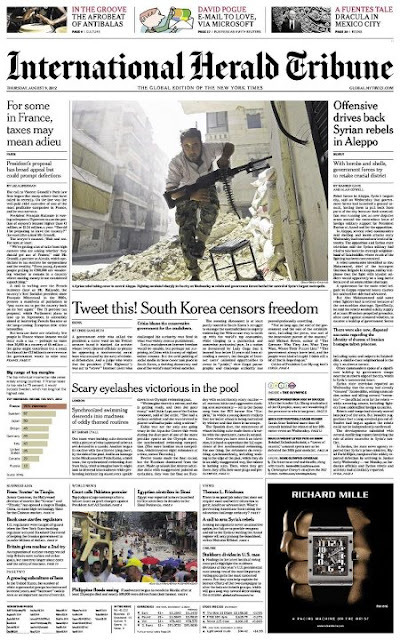 I already mentioned the degradation of South Korea rankings in the Press Freedom Index (see "25 years later"). Nothing new under the sun. But. This is not the kind of headlines that make a government happy. They prefer when major international media talk about Korea's successful olympics, or when they set themselves the political agenda. Say, for example, why not a last minute visit to Dokdo, eh? Done! And by a miraculous coincidence, precisely two days later (see "Worst followers"). 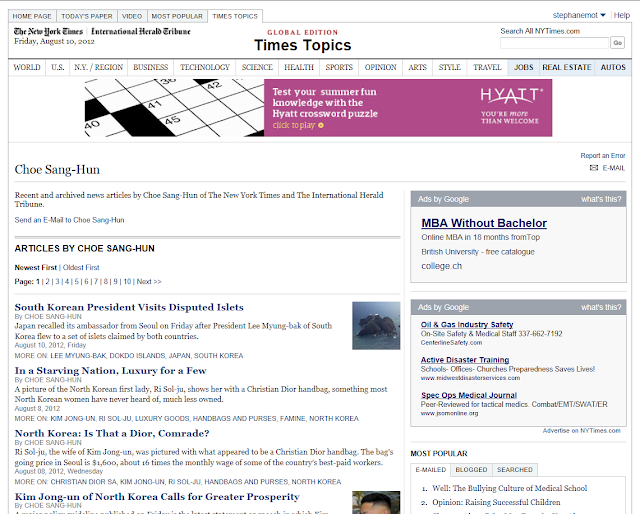 One of the reasons why I made this bet with myself (even before the sad Dokdo episode) is that a couple of years ago, there was an interesting mutation of a NYT/IHT article between the web and the print editions, when "South Korea Admits Civilian Massacre During War" became "South Korean panel confirms full horror of civilian massacres" (see "Lost In Translation ?"). For the first time at the international level, this administration officially distanced itself from the Truth and Reconciliation Commission it was supposed to support. The termination of the institution in the months that followed was so messy that the man in charge of the dirty job eventually got fined (see "Truth and Reconciliation - Justice at last"). 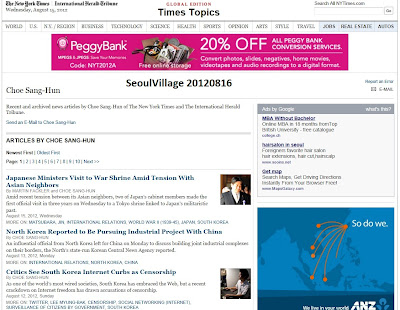 At the headline level at least, I'm sure Cheong Wa Dae approves the new editorial line: the previous articles were exposing the lavish lifestyle of the North Korean elite, and the latest one relates the visit of the Korean President to Dokdo. Nevermind other truths, and forget about reconciliation. 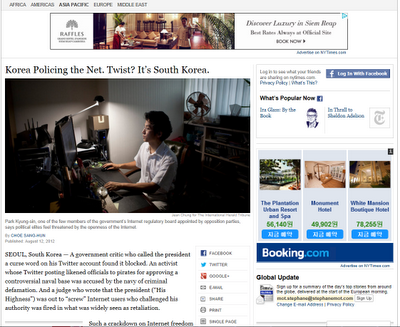 One week later, the article eventually made it online (link: http://www.nytimes.com/2012/08/13/world/asia/critics-see-south-korea-internet-curbs-as-censorship.html?_r=1). Do you think I still believe I won my bet? You betcha! Advertising remains the usual pressure point in this kind of cases. But the article is consistent with the editorial line. The NYT is not into word mincing, and the NYT Company doesn't own major broadcasting outlets, which makes it more independent than its rivals. Yet this title had probably more chances to pass when the guard was lowered, in the dead middle of the summer.